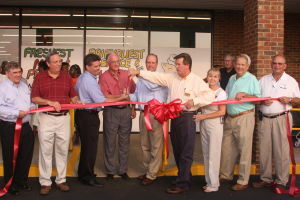 Store owners Ricky Treadwell and Keith Howell cut the ribbon Monday morning with help from Barton Rice and Stanley Houston. Participating in the ceremony were, from left, Representative Gerald Greene, County Commission Chairman Richard Ward, Rice, Houston, Howell, Treadwell and wife Pam, Development Authority Chairman Olin Thompson and Mayor Ric Hall. At long last, the request made most often by Early County citizens became a reality Monday at 8 a.m. with a ribbon cutting for Piggly Wiggly located at 113 North Main Street. The grocery store will be managed by WallStreet Markets of Dothan, the owner and operator of two Piggly Wiggly stores in Dothan and one in Enterprise. Ricky Treadwell, president of WallStreet Markets, and Keith Howell, vice president, stated the 23,000 square foot store is a full-service grocery store, including a feed department. "We are thrilled that this day has finally arrived," said Lisa Collins, the director of Economic Development for Early County 2055. "Securing a new grocery store in Blakely has been a major economic development initiative for Early County 2055 since our Economic Visioning Planning Weekend in April, 2006." "Through a concerted effort by Early County 2055, the City of Blakely, the Early County commissioners and the development authority, we will now be able to recapture much of the local spending that is currently leaving the county," stated Collins. The new grocery store will serve as the anchor in the overall redevelopment of North Main Street. The refurbished "big box" also means more property taxes for the county, and it will enhance property values for other property owners on North Main. A grand opening begins today in conjunction with the advertising specials in the Early County News. Free hotdogs, free samples and drawings for prizes will be available at the store Wednesday, Thursday and Friday — July 1, 2 and 3. Everyone is encouraged to come by and get to know the store owners and employees. "Many of you already know us from shopping with us in Dothan," store owners Treadwell and Howell told the crowd at the ribbon cutting. "We are glad to be in Blakely now, and we promise you will see the lowest grocery prices you have seen for a long time in Blakely."